Wayans. The mere mention of the name likely brings to mind the talented siblings who took Hollywood by storm in the 1990’s and successfully created a dynasty that traversed the decade and reigns to this day. Determined to carry the torch, the latest generation of Wayans is working hard to earn their rightful place on the throne. Says Damien, “There was always a misconception of what it’s like being a Wayans or a second generation Wayans. A lot of people thought we were just born into money and it was like—nope—it was a tough road, a tough journey.” But the Wayans are nothing if not tough. The new kids on the Wayans family block have taken the popular misconception of a cookie cutter lifestyle and capitalized on it, resulting in the launch of BET’s Second Generation Wayans show. In keeping with family tradition Marlon Wayans, Damien’s uncle, is one of the executive producers for Second Generation Wayans. 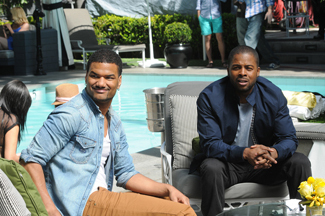 The show, which Damien says is largely based on real life experiences, reflects years of the ups and downs, successes and failures which he and the younger Wayans have experienced while trying to break into showbiz. Because ‘elders’ Shawn, Keenen, and Marlon have frequently appeared in the spotlight, the assumption is that the entire Wayans family is solidly linked into the film industry. With Second Generation Wayans Damien, his cousin Craig, and Uncle Marlon wanted to dispel that notion and portray the true path which the younger generation has taken. Underneath it all is the rocky, albeit quirky, and genuine love that is the glue that bonds the Wayans together. The multifaceted Damien Wayans is slowly proving his staying power in this industry, leaving no doubt in anyone’s mind that he is indeed a ride or die Wayans.